Life is like a box of blood oranges – you never know what you’re going to get. Sometimes you’ll find those perfect oranges of an unassumingly orange-ish skin, but with a deep, dark red coloured flesh. Those are my favourite. They are sweet and have an intense flavour that take me straight to a sunny Sicilian beach. But not all blood oranges have been created equal. And that’s where the magic is. Is the excitement of opening up the first orange. The joy you feel when you find that perfect red one. Or that delightfully sweet one. Oh, that’s pure happiness. But what would you do with a box full of blood oranges? Well, I’ve spent an entire weekend experimenting with various ways of preserving them. First, I made the traditional blood orange marmalade – a two-day long messy operation that requires quite a lot of patience. The I made candied peel and candied orange slices – to be used in all kind of desserts. And for the first time I made a batch of dehydrated orange slices – to be used as garnish for cocktails. Bring the water and sugar to a slow simmer. Add the sliced oranges and let them simmer gently until they begin to soften. Take the orange slices out on a rack and allow them to cool. Whisk the eggs, then gradually add the flour and continue whisking until you get a thick batter. Add the milk, vanilla extract, sugar and salt and whisk until you get a thin batter. Heat a frying pan and add 1/2 tsp of butter. When the butter has melted, add ladle of batter and swirl until it has covered the surface of the pan. Cook for 1 minute and flip to the other side. Cook for another minute. Repeat with the remaining batter. Fold each pancake in 4 and set aside. Place the sugar into a heavy bottom pan and let it melt on low heat until you get a light caramel. Take the pan off the heat, add the orange juice and zest, the Grand Marnier and the butter. Return the pan to the hob, add the candied orange slices and continue cooking until the sauce begins to thicken. At the end, add the folded crepes and continue cooking for another minute. 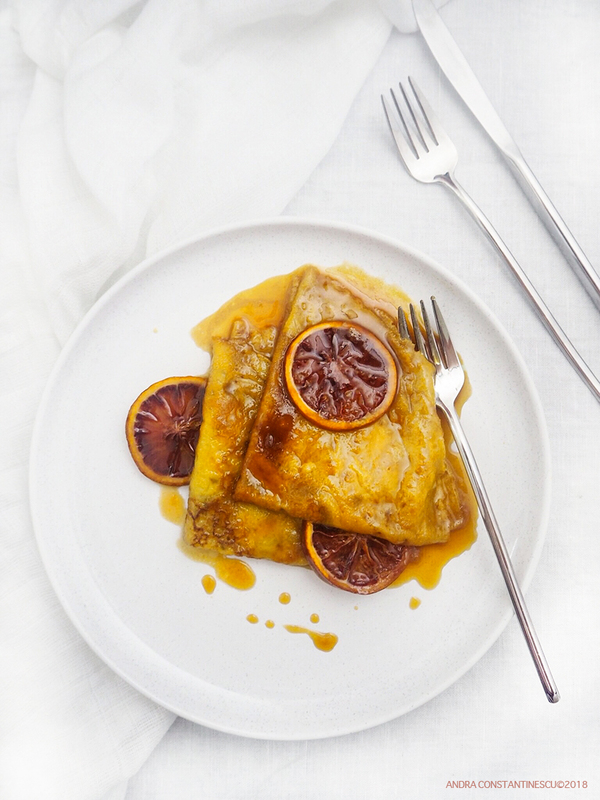 Place two crepes on each plate, add a tablespoon of the sauce and garnish with orange slices.